You have received a temporary crown today. 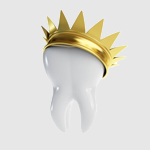 This crown is designed to protect your underlying tooth structure while the permanent crown is being fabricated in the lab. The type of cement that holds this crown in place is very weak. Therefore, you have to follow the instructions below to prevent the temporary crown from dislodging. Don’t floss around it, for it will dislodge: however, proper brushing is a must, Don’t eat on it, for it will dislodge. You can eat on the other side of your mouth.